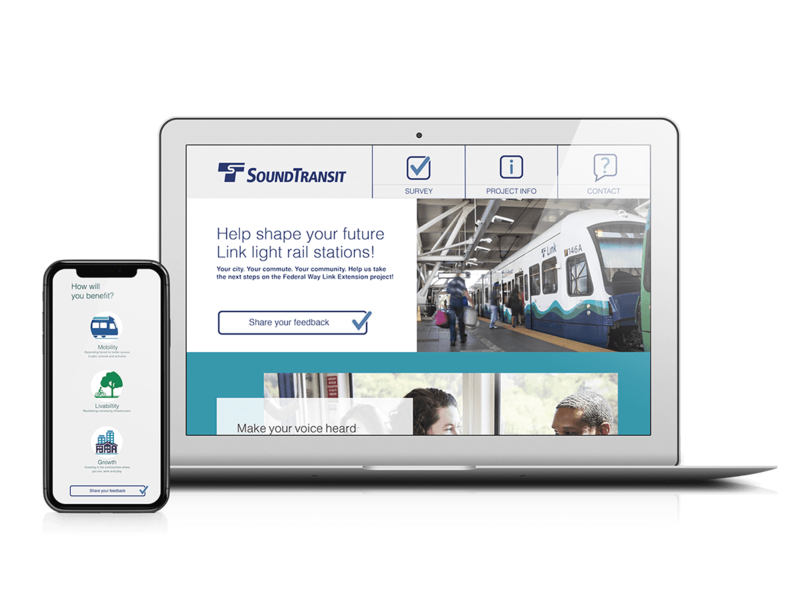 Working with the City of Federal Way and Sound Transit, I designed their online open house microsite which served to present relevant information and collect feedback about the future Sound Transit station appearance. The site features Sound Transit photography and custom iconography pulling from the ST3 campaign assets and illustration style. As the Link light rail grows, Sound Transit continually seeks public input and neighborhood approval. Not everyone can attend these open houses in-person, so WSDOT organizes online open houses. These extend comment periods and allow interested parties to respond by email. I designed and help execute a branded site that presented information clearly, concisely and in multiple languages with very a short turn around. Working within the tight deadlines often associated with govermental projects, design moved quickly and development began early. There wasn't the time to perform rigorous resarch, create user personas or user-test the site before launch. A large portion of the Federal Way populus are non-native english speakers. This became our focus and biggest hurdle for a positive user experience. Many sites rely on the Google Translate plugin as an easy fix for a multi-language audience. My firm enlisted the services of Dynamic Language and independent translators, to ensure perfect translations for each page of the site including reporting the collected data after closure of the comment period. After approval of my designs, one of my tasks was to input the translated content for Russian, Vietnamese, Spanish, Korean and Somali into the duplicated pages. At the outset, I wanted to create a responsive, simple and easily navigable site where content was broken up into digestible chunks. 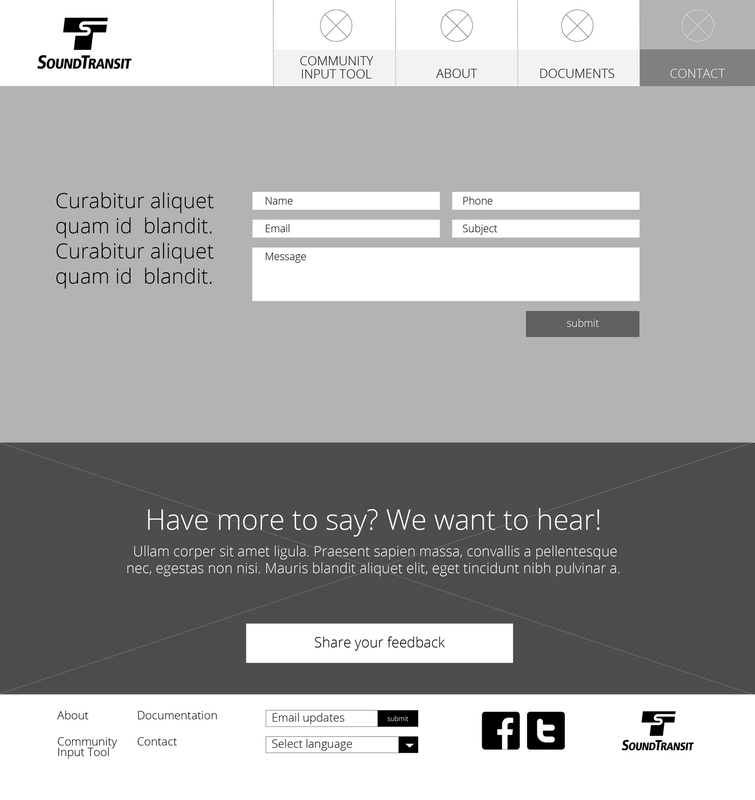 I chose a simple and reliable two column / four column layout that moved users through the site to the final call to action, taking the Sound Transit Survey facilitated by my firm. I presented the wireframes on-site to Sound Transit employess including their Senior Graphic Designer, Project Managers, and Station Engineers who all approved the layout and information acrhitecture. The final design is a stand alone piece but references Sound Transit branding. To ensure this, I worked closely with their Senior Graphic Desiger. 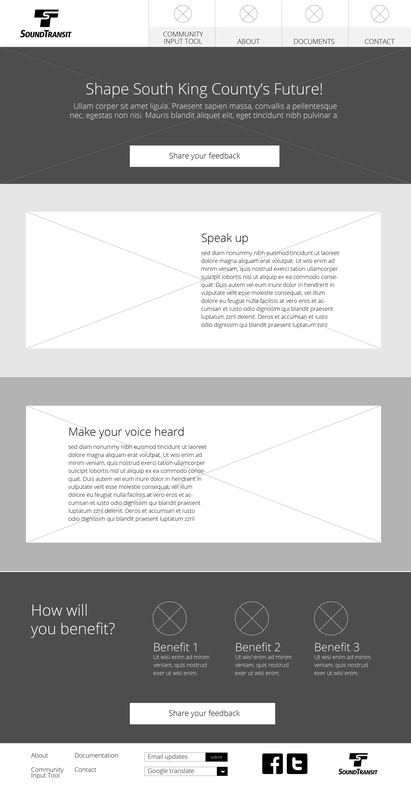 The custom nav icons and illustrations were appoved by her before applied to the design. This project moved quickly and with few snags thanks to enthusiam in public servie and a highly collaborative team.